Jamie Maclaren has pushed himself back into the reckoning for a place in Australia's World Cup squad despite missing a penalty against Aberdeen. 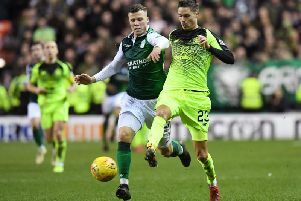 The Hibs striker was today named in a provisional 32-man squad for the finals in Russia this summer but faces an anxious wait as Socceroos coach Bert van Marwijk will whittle that number down by six before they head to a training camp in Turkey. Maclaren has scored five goals for the Easter Road side after arriving on loan from German side Darmstadt, netting in Hibs first two post-split wins against Celtic and Kilmarnock. The player claimed further goals in the Capital side's final three games against Aberdeen, Hearts and Rangers as they continue to push for a second place finish in the Premiership would further strengthen his case but he saw a weak first half penalty saved by Dons goalkeeper Joe Lewis before sending a header over the bar in the score-less draw at Pittodrie. However, Maclaren is one of seven forwards in the squad named by van Marwijk, which also includes 38-year-old Millwalll hitman Tim Cahill, the Aussie's Dutch coach claiming he is a "special case" as he bids for a fourth appearance at the World Cup finals despite the veteran, currently serving a three-match ban, averaging just six minutes of game time in ten substitute appearances for his club. Celtic midfielder Tom Rogic is also in a squad which contains six new faces. But his performances in the green and white Hibs have not gone un-noticed in his homeland, the Sydney Morning Herald describing him as "one of Australia's most in-form players." The 24-year-old will have two further opportunities to shine, in tomorrow night's derby against Hearts at Tynecastle and Sunday's season finale with Rangers, a game which could well decide which club finishes runners-up to champions Celtic, Maclaren well aware he's already scored against both of those sides. Shortly after the Rangers match van Marwijk will cut his squad to 26 before they travel to Turkey for a 20-day training camp before playing pre-World Cup friendlies against the Czech Republic in Austria on June 1 and then Hungary in Budapest eight days later. They will then travel to the Russian city of Kazan for their opening Group C match against France which will be followed by games with Denmark in Samara and Peru in Sochi.